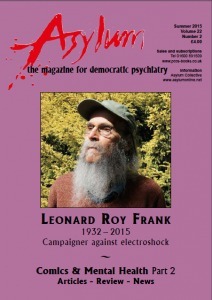 We briefly featured the life and work Leonard Roy Frank on pages 7–10 of the recent Electroshock issue of the magazine – Asylum 21:3 (2014). Now we are sad to report that his long and principled struggle against the routine abuses of medical psychiatry has come to an end. If you missed it, we highly recommend that you check out that issue of our magazine, and also the fascinating blogs about LR Frank’s life and work: www.madinamerica.com/2015/01/memoriam-leonard-roy-frank/ There are several other great items of general interest, but this is also the second in the series featuring Comics & Mental Health. Guest editors Meg John Barker, Joseph De Lappe & Caroline Walters now focus on depictions of depression, anxiety and psychotic experiences. Meg John writes about how drawing comics has helped the artists to understand and express some of their experiences, while Alex Reed considers the resonances of Marvel Comics with the anti-psychiatry movement. Wendy Couchman presents Cheese or Ham? – a lady with insights on aging, dementia … and crab? Matthew Green interviews Ravi Thornton about her project HOAX, which concerns her brother’s struggle with schizophrenia. Katherine Hubbard writes about the character of Rorschach in Watchmen, and Sasha Garwood reflects on representations of mental illness in Neil Gaiman’s Sandman series. Finally we have some great work from the comics artist Brick (author of Depresso) and from Simon Wharne and Liz Greenfield, who are included in every feature this year.